MOTU has announced the UltraLite MK3 Hybrid, described as "the world's first hybrid FireWire/USB2 audio interface for Mac and Windows." 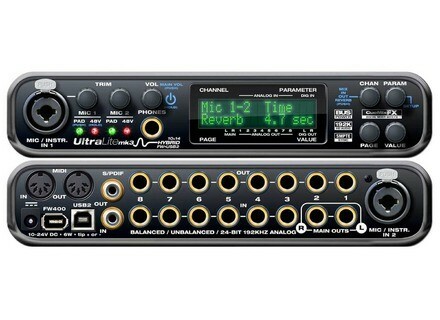 The UltraLite-mk3 Hybrid is designed to provide flexible and mobile operation via FireWire or hi-speed USB2 connectivity to a Mac or PC computer, with professional audio quality at samples rates up to 192 kHz and plenty of I/O, including two mic/instrument inputs, six line-level analog inputs, ten channels of analog output, stereo S/PDIF and a stereo headphone output. As the first-ever "hybrid" audio interface of its kind, the rear panel of the UltraLite-mk3 Hybrid provides both a FireWire A (400 Mbps) and hi-speed USB2 (480 Mbps) port. Users can connect the UltraLite-mk3 Hybrid to their computer using either port for full-featured operation and ultra-low bus latency, the company says. According to MOTU, using FireWire provides the added benefit of fully mobile bus-powered operation, with enough power through the FireWire cable connection from the computer to support all features, including 48-volt phantom power to both mic inputs. An included power adapter can be used for USB2 connectivity, or operation as a stand-alone mixer. The UltraLite-mk3 Hybrid will ship Q4 of 2009 at the same price as the original UltraLite-mk3. No pricing has been announced yet. R. Pechayre Virtual Metronome v2 Virtual Metronome (vMetronome) is a metronome for iPhone/iPod touch. TeamDNR Electronic Elements Volume 1 TeamDNR Collaborative Designs has announced the release of Electronic Elements Volume 1 for Audjoo's Helix, which is the first in a series of soundsets which focuses on elements usable in various types of house, trance, techno and ambient music. eSession.com Updates Virtual Glass eSession has updated the Mac OS X RTAS, AU and VST versions of its Virtual Glass Plug-In to v1.2.12.